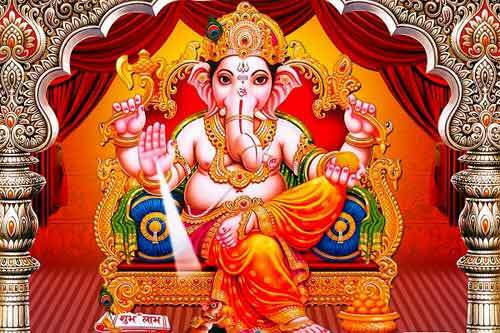 Sindur Lal Chadhayo Ganesh is a popular prayer and aarti dedicated to Ganpati. This prayer extols the importance of Sindoor offering to Ganesha. The vermilion red or orange-red colored cosmetic powder is a favorite of Ganesh. The person doing or offering Sindhoor should chant this mantra and apply it on the forehead of Ganpati. After applying it on the forehead of Ganpati, the person should apply it on his/her forehead and of those present in the puja especially of children. A person offering Sindoor will be blessed with peace and prosperity. It is performed for early marriage. Those couples not having children will be blessed with intelligent and healthy children if sindoor is offered to Ganpati for 21 days without a break. It can be done even when the wife is having her monthly periods. It is good offering before leaving the house on important missions. Good for people who are going to job interview and exams. How to offer Sindoor to Ganesha? It can be offered in the morning, afternoon or during the evening. Take bath and offer prayers to Ganesha. Do the puja facing north or northeast. Sprinkle water on Ganesh murti or painting. Wipe it clean. Offer red color flowers or durva grass. Light agarbatti of fragrant flowers. Apply sindoor on the forehead of Ganesha by chanting the above-given mantra. Then apply it on self and on the people present. Offer modak or a sweet or a seasonal fruit.